The chants were getting louder and louder, echoing through the halls entering the stadium. Every second, more Americans were joining in the chant. American pride was oozing through the hallways. The echoes were so loud all the other teams could now hear it. The American’s are here and they want everyone to know it. At this moment, I felt prouder to be an American than I ever had in my life. As I got off the plane and was walking towards the immigration lines in Toronto, I noticed there was a sign for anyone involved in the Pan-American Games. I understood that these games were the third largest multi-sport Games in the world, but to have our own immigration lines? That’s just too cool. Just the day before, I had received my accreditation. I didn’t know why I needed it before I left but now I knew. I showed it to the security guard at the beginning of the line and was allowed to proceed. The line was completely empty. I must have passed 100 disgruntled international travelers as they watched me go to the front of the lines. I was the guy he was waiting for. He brought me over to a desk where my accreditation was confirmed. After we picked up my bags he put me in a shuttle that was waiting for me outside. The shuttle took me to the Hilton where only Team USA members were to check in. Once the check in was complete we took our Team USA duffle bags full of gear and the men’s and women’s tennis teams loaded up two vans. 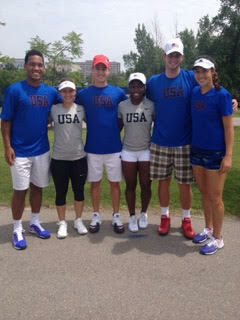 We were going to stay at a hotel near the tennis center instead of the athlete’s village. The hotel was 10 minutes away WITH traffic. The village was downtown, at least 45 minutes away. 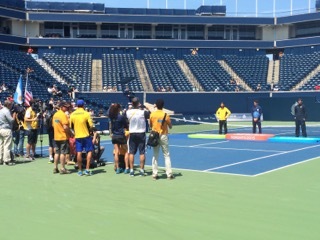 The tennis events were held at the Aviva Center at York University. 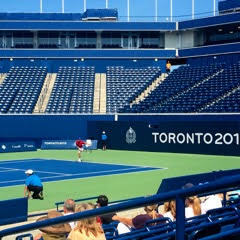 The Center was built in 2004 to host Rogers Cup, one of the biggest men’s and women’s professional events, every year. Other than practicing at such a prestigious center, it was business as usual. We went through the same practice routines as we would at any other event the day before a match. I was scheduled to play the first match on stadium court at 10am. With the capacity to hold 12,500 people, it was by far the largest stadium I had ever played in. Fortunately I practiced on stadium court the day I arrived, so I knew what to expect. As the match against Mexico’s Hans Hach was set to begin, I waited in the tunnel entrance until security informed me it was time to enter the court. While doing some simple dynamic movements to keep the nerves at bay, it dawned on me that in this tunnel, some of the greatest players in tennis–Roger Federer, Rafael Nadal, and Novak Djokovic–all waited in the very spot I was standing in to go out for their match. And now here I was, waiting for my name to be called so I could walk out to center court and represent the United States of America in one of the biggest events in the world. After losing a close first set filled with nervous mistakes, I got up an early break in the second set and went to the back fence. As the ball kids were throwing the balls down to my opponents side of the court, I touched the fence and walked alongside it. I told myself to take everything in for a second. I glimpsed around the stadium and noticed there couldn’t have been more than 100 fans. I felt the hot cement court under my shoes. I then looked at my team and fiancé just to the right. I thought to myself “win or lose, I will have still represented, what in my mind is the greatest country on earth, in one of the biggest events in the world. No one will ever be able to take that away from me.” A big smile came to my face. About 45 minutes later my opponent sent a backhand cross-court wide and it was game, set, and match for me, for Team USA. 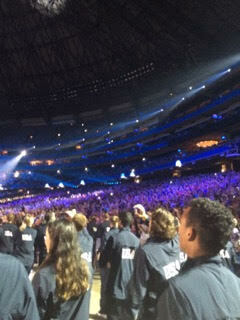 That night was the opening ceremony. I’m not sure why it’s called the opening ceremony when events have already started, but whatever. I was happy to be there and even happier knowing that I was still in the running for some medals. I couldn’t imagine what it must feel like to walk in front of 45,000 people knowing I was already eliminated. Every country was brought into a giant lobby in a building next to the Rogers Centre, home of the Toronto Blue Jays. While everyone anxiously awaited for their country to be called into the ceremony, athletes and coaches roamed around, asking others to trade for pins. Pins were the personal prize of the Games. With every new pin acquired from a different country, each athlete turned into a 5-year-old, showing the prize off to their teammates. Immediately every American stopped what they were doing and began walking towards the two large open doors in the corner that lead into the Centre. Once into the hallway of the Centre, Team USA’s national pride couldn’t be contained any longer. USA! USA! USA! The only times I sang that chant were as an observing fan while watching USA compete in an event like the World Cup. This time, I wasn’t a fan. I was singing along with the rest of the athletes that were selected to represent USA. As we walked in front of the sold out crowd, I made sure to put the phone down and stop recording. I wanted to take this moment in just like I did on the tennis court that day. It was surreal. Unfortunately it went by so fast it felt like a dream. I replayed the videos on my phone hundreds of times just to make sure it was a reality. I ended up losing a tough three set match in the next round to Venezuela’s top singles player. My partner (Dennis Novikov) and I ended up losing in three sets in the quarterfinals, one round short of the medal rounds. I felt such a deep sadness following the doubles loss. My chances at winning a medal at the Pan-American Games were gone. The walk back to the locker room took years. I did everything I could to be mentally and physically ready for the games. I tailored my schedule and training so that I would be peaking at the Games. Finding out that our doubles opponents went on to win the gold made me feel even worse. I knew it could have been Dennis and I at the top of the podium. I want to thank my fiancé for making the trip to Toronto. 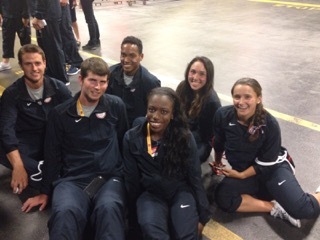 I want to thank both the men’s and women’s teams for making this such a fun trip. All of you were fantastic teammates and even better people to be around. It was a pleasure meeting everyone and I wish you nothing but the best. I want to thank Brad Stine. Simply put, you’re a great coach. I can’t forget Jeff and Derrick for going above and beyond to provide the teams with everything we needed. You guys did way too much. Finally, I want to thank everyone at the USTA who made this possible. You gave me a chance at representing my country in one of the biggest events in the world. For that, I will be forever grateful.